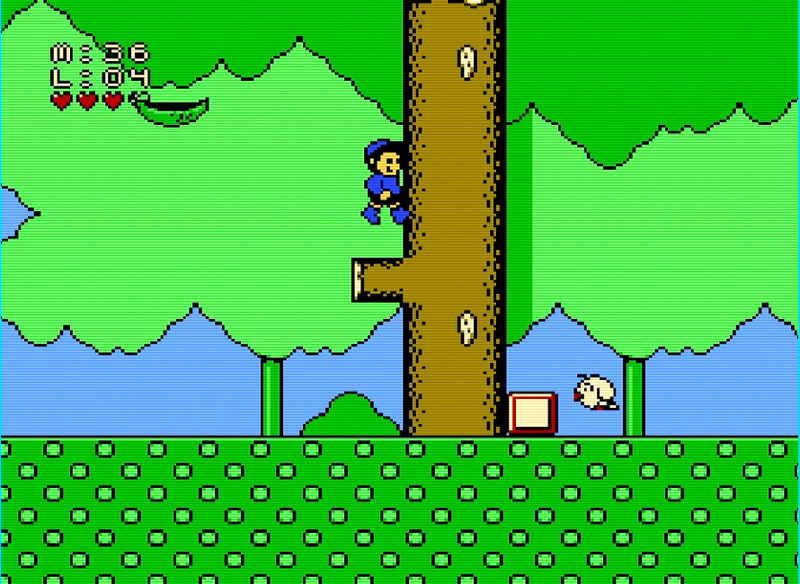 When you think of the NES you think of some classic 8bit platformers. Everyone knows Mario, The Turtles, Battletoads, and Kirby. They’re all classics in their own right. Not everyone, however, has heard of McDonaldland (or M.C. Kids if you’re an American). It’s one of the best platformers on the NES, hands down, and therefore one of the best licenced games of all time. The UK Box and Cartridge artwork. The sprites of Mick and Mack in the game looked nothing like the box art versions. However Mack was a completely different sprite to Mick rather than a simple recolouring. Perhaps even in 1991 that’d have been too controversial to try. The game see’s you playing as either Mick or Mack and you’re tasked with returning Ronald McDonald’s Magic Bag to him. The Hamburgler, evil sod that he is, has stolen it and only you can get it back. Much like Mario 3 there are different themed worlds. You start off with 6 levels in Ronald McDonald’s world. However completing every level isn’t enough to see you advance. Hidden in each level is a McDonalds card and you need to collect 4 of these to be allowed access to the next world. This encourages you, as the player, to explore each level. To help you throughout the levels you can collect floating Golden Arches, aka McDonald’s logos, to get more points and extra lives. The cards you need to collect also feature, you’ve guessed it, the logo of good ol’ Mccy Ds. It’s admittedly product placement taken to the extreme but given the games setting it works. Forget Warp Pipes. It’s all about helping Mick and Mack go through Ronald McDonald’s Zippers. Actually… That sounds so wrong doesn’t it? It also featured more than a few ground breaking gameplay mechanics. There was the zipper. Think of this like a Mario Warp Pipe. You used it as a handy shortcut between levels. Most notably, however, was the spinner block. If you sprinted over the spinner block gravity would be reversed. Up was down and vice versa. It added a puzzle like element to obtain certain cards and power-ups. You also could now “fall” to your death at the top of the screen rather than the bottom which definitely upped the difficulty. The tree was a bugger. I’ll admit that. You couldn’t walk through it, oh no, you had to climb up one side and then back down the other. Difficulty… If there is perhaps one criticism of this game it’s the difficulty level. It’s a steep learning curve, rewards the more patient player who explores, and can in places be more than a little frustrating. Another issue was the lack of a save game or even password save feature. With a game of this size it was seriously needed. My friend and I once played through in the co-operative two player mode over 4 days (leaving the NES on) and had made it to the final level. We were so excited that we’d finally be able to reunite Ronald with his Magic Bag. Then the power cut off. Frustration doesn’t even come close to describing how I felt! The springs. And Mack. At the start of the game, and at various places throughout, you had the choice to switch between Mick and Mack. They didn’t really look like the versions of the character on the box art mind you. And don’t get me started on the springs. Certain springs were randomly 6 times as powerful as the normal ones. And if you tried to remember which one was the super spring? The game would randomly make a different spring the super spring. As you can see from the screenshots the graphics were very good for a NES game. Lots of colours on screen, nice sprite animation, and it really does look more like an early SNES game than a NES game. The audio was good too. Some great music and good sound effects. The little touches like that really did make this game feel so fun to play despite the steep difficulty level. You see that ice? It was SLIPPY! You started running on that and the momentum often carried you to your doom. If you’re lucky enough to have a working NES you can pick an unboxed cartridge up for around a fiver. Us Europeans also saw McDonaldland released for the C64, the Amiga ST, and MS-DOS. I’ve played the C64 version which, if memory serves me right, had some pretty dire loading times of about twenty minutes per level, and awful controls so that may be the one to avoid. Ah CosMc’s world was set on the Moon. What was pretty cool was that the games gravity was adjusted accordingly. You could jump for miles and you’d slowly float back to the ground. Pretty innovative stuff when you think about it.